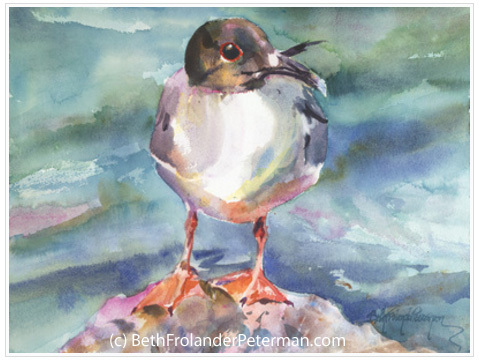 Corvallis watercolor artist, Beth Frolander Peterman, created this delightful swallow-tailed gull painting with a lot of softness and color. I really appreciate Beth’s perspective on this cute little gull. With the front view and its head turned sideways, we can see all the circles (mandalas) that make up the eye, head and body of the gull. Even the beak, the foot webbing, and the hard surface the gull is perched, on have curved surfaces. I love working with and seeing art created using watercolors because of the beautiful flow in and all around all the different colors. And even though you can have a ‘hard’ edge to better define what we’re seeing, that seems to be made softer with a water-based medium. …I enjoy capturing in paint, the delightful creatures and people that surround me, as well as the familiar vistas that I have grown up with here in Corvallis and beyond. Vacations to me involve wildlife and an immersion in “their” natural habitat, observing and enjoying their antics and quietly recording them with my camera for future paintings or painting en plein air in the moment. Check out her other beautiful paintings in her online gallery. And if you ever happen to be in the Willamette Valley Oregon area in late October, she hosts one of the studios for the annual Philomath Open Studios. Beth’s painting reminds us to see the world around us through eyes that are softer and gentler.